Second floor deck adjoining the guest quarters, boy what a view! 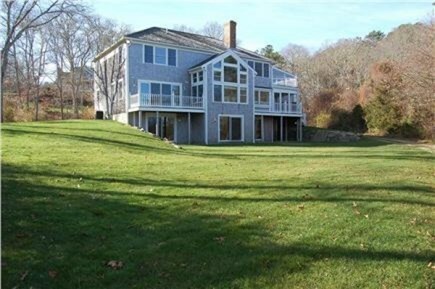 This one of a kind, magnificent, 6 bedroom estate is perfectly situated on Little Pleasant Bay and on nearly 4 acres of pristine, wooded land with 170 feet of sandy beach front. Stunning views from almost every place in the home, multi-level decks. The property consists of the main house, an attached 3 car garage with en suite guest quarters above, and a beachfront cabana/boathouse. The main house house features 4 en suite bedrooms with a master bedroom on each floor. The main floor includes a large en suite master bedroom with a private deck, large living room with floor to ceiling windows. The steps to the second floor take you to 3 en suite bedrooms (including another master bedroom), and a sitting/game room with breathtaking water views. The second floor deck connects with the spacious two bedroom en suite guest quarters over the garage with a large living room and a kitchenette overlooking Pleasant Bay. Included custom features in the main home: professionally decorated interior, full laundry room, central vacuum, central audio system throughout house, central A/C, a full walkout basement kids tv area and ping pong table, a 3 car garage, outdoor hot/cold shower and a gas grill. This property will be sure to exceed all of your expectations! Additional availability info: This property is availabe for rent during off season(s) not indicated on the calendar. This is a Saturday to Saturday vacation rental. Additional pricing info: There is an additional cleaning/linen fee charge of $550.00 ** 3 NIGHT MINIMUM FOR HOLIDAY WEEKENDS, State and local taxes of 12.45% will apply. This is a perfect home for multiple families or friends who want to enjoy a Cape stay. Immaculate and ready for our stay. quiet but accessible to everything. Love the kitchen and access to beach. There was plenty of room for 11 of my family. Everyone could be together or have a private space of their own. The beach was great for our daily walks. The lawn areas had room for paddle ball. All in all we had a wonderful week, one that my family will remember. We traveled to the Cape from the west coast and the area and the beaches are so different. We had a lobster dinner at home and the kitchen had all the cracking utensils. We just returned from a week at this lovely home and let me say that the pictures and descriptions listed here do not do it justice. The home is very large, and the bedrooms are nicely spaced such that you always felt you had your own little corner. We had 15 people stay (6 adults, 9 kids) and never once felt crowded. The home is nicely furnished and has many luxuries (built in stereo system through house, jacuzzi tub, separate AC zones, huge closets) that we didn't expect. The basement also has 3 single beds and a big TV so that became a great, unexpected place to stick the teenagers. The acreage was nicely divided up between a big driveway (necessary for multiple families! ), a large grassy area for sports games, and the beach. The beach was fantastic for catching crabs, short walks, watching boat traffic, relaxing and digging for clams. The boathouse by the beach has a lot of storage space and so you don't need to haul your gear back and forth. There are plenty of beach chairs there already, and we kept a cooler there so we could have cold drinks by the beach. If you own them, bring your kayaks because they are perfect for exploring the calm bay. I would hesitate to call it a "private beach" exactly. The beach seems to be a shared area between longtime neighbors and so sometimes (not too often) you would have other people right next to you. Some folks would even walk the path right behind the house to reach the beach and others would drive there to have small bonfires at night. Everybody seemed friendly enough but it was disconcerting to have other people on "our" beach, especially late at night. With that being said, I suppose that many Cape private beaches have this implied shared access so it probably isn't unusual. Still, it was a bit surprising. The upside of the 'shared' beach is that there are two nice long docks that we were told we could use (part of the 'sharing') so the kids loved being on them and catching crabs. Surprisingly, if you have a fisherman among your group they will be disappointed- we had no luck at all from the docks or in a boat. The bay itself was very warm and relatively free of seaweed so you could swim in it. No sea birds at all, and no waves so don't bother to bring the boogie boards. There were always horseshoe crab and scallop shells to find on the beach. The one very pesky thing about late July was the green flies, which are stinging horsefly-like bugs. There are traps set up to catch them but they somehow manage to find your legs anyway. The best way to avoid them is to be on the docks where the wind blows enough to keep them away. Other little things to note of minor significance: lots of beach towels and regular bath towels there so no need to bring more. The screened porch is fantastic but only has 4 regular seats so you need to carry in a few from the deck. The apartment above the garage is perfect for a family- has 2 bedrooms, a common TV area, a pullout couch, shower, kitchenette with mini fridge, etc. Besides the refrigerator in the kitchen there is another full fridge in the laundry area which is a huge bonus for multiple families. Kitchen is well stocked but the oven is small, no garlic press and few casserole type dishes. Plenty of everything else. Outside grill is a Weber and worked great.